Chris McCullough is a narrative painter working in oil, encaustic and mixed media. Her work, which is often layered with wit and dry humor references the fear, absurdity, insecurity and wonder of everyday life. Primarily concerning women, the underlying focus of her work draws attention to a cultural landscape fraught with stereotypes, misguided desires, seemingly harmless objects, and outdated cultural conventions. A native of Baltimore, Chris received a BA from the University of Maryland, Baltimore County and a MFA in Painting from the Maryland Institute College of Art. Before arriving at YSU, she taught at Villa Julie College and Towson University, both in Maryland. Prior to receiving her MFA, Chris worked in the private sector as an art and creative director for advertising, publishing, and communications and marketing firms. 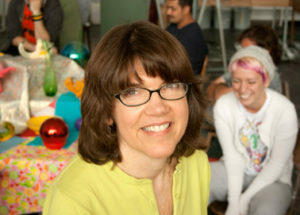 Her work has been exhibited nationally and is included in numerous private collections.